A back of the envelope, or “BOTE” analysis, is intended to give you a broad brushstroke view of the economic feasibility of a potential transaction. BOTE-level analysis is used to quickly screen potential deals in and out of one’s deal pipeline. A high level of detail is purposefully forfeited in BOTEs for the sake of speed of execution. For an apartment building development, BOTE feasibility analysis focuses in on the Land Purchase Price as it relates to the going-in (Year 1) yield on cost (the Year 1 stabilized cap rate). Land Purchase Price is typically solved for on a residual basis, meaning the land value is what is left over after a targeted initial level of yield has been achieved. Development BOTE analysis assumes the hypothetical situation where you could purchase the land at an assumed price today and then snap your fingers and the contemplated building would instantly appear and be at stabilized occupancy. As such, today’s hard and soft development costs, cost of debt and rents and expenses are used as inputs. The logic behind doing this is that if the deal does not look good using today’s values, about which we have a very high level of certainty, it’s not worth pursuing because we have significantly less certainty about the amounts to use for these variables years into the future. Click on any blue input value to make changes. Hit Enter or Tab after you have made an input, and then click on the next input field to edit it. Click the Save file button at the top to save your work periodically. A tutorial video is at the very bottom of the page. 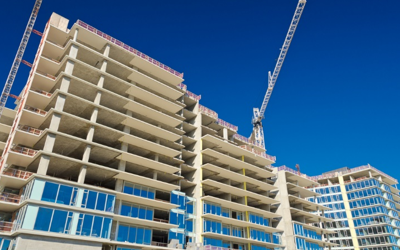 A development site zoned for multi-unit residential use will typically have a density constraint in terms of the total gross square footage of building allowed on the site or a ceiling on the residential unit count. Our calculator has the ability to analyze a site both on an FAR basis as well as on a Units basis, and you can toggle between the two within a single analysis file. FAR stands for “floor area ratio”, but we like to think of it as “floor area to lot size ratio”. FAR is simply the ratio of the allowable above-ground gross building area to the site area. An example of an FAR ratio of 5.00 would be a 10,000 square foot development parcel with an allowable above-ground building area of 50,000 gross square feet. Valuate’s BOTE calculator allows you to enter in a target Year 1 yield on cost to solve for the Land Purchase Price on a residual basis. In other words, once you have development costs and rents and expenses inputted, you can override the value for “Current” Stabilized NOI Yield on Cost and watch the Land Purchase Price update. Sensitivity analysis is a way of stress-testing key calculation-based outputs based on the changing of one or more inputs that impact the output in question. Each of our calculator’s Profit Margin sensitivity analyses shows the intersection of two key inputs, with increments of change for each input, and the resulting spectrum of values for the profit margin. If you have been following REFM, you may remember that this tool used to be offered in Excel. Recognizing that these BOTEs are often run in the field, and that Excel is just plain awful to use on your phone, we put all of the capabilities of the Excel template onto Valuate® so you can run analyses comfortably no matter where you are. Enjoy.